The Trawler Lifestyle is a great escape from the routines of the traditional 9 – 5 work world rat race. Instead of sitting in traffic or staring at your computer screen while gazing out an office window – you are sitting in a helm chair and looking out your pilothouse…at waterfront views! You don’t need to be a wandering adventurer to enjoy the Trawler Lifestyle, plenty of people don’t have the time to go out “real cruising”, just floating at anchor and sitting in a marina waiting for your time to depart outside the harbor can do marvelous things for your blood pressure and overall health. If you have the desire to do this you are more likely to succeed if you work out a game plan that will help you achieve success. Learn as much as you can about the Trawler Lifestyle, it’s a fascinating subject and if you can combine boat ownership with a time in your life where you are in the retirement years or a sabbatical, you may liken it to the ultimate year-round summer vacation. There seem to be three key ingredients to enjoy the Trawler Lifestyle and they are TIME, HEALTH and MONEY. MONEY – Money is the easiest part and the one over which you have the most control. You either have it or can borrow it…or it’s out of your reach. If you have the opportunity to buy a trawler that is perhaps less than what you “dreamed for” but capable of transporting you to the cruising grounds you have imagined, it may be better to lower your expectations and go for it, rather than waiting for your bank account or loan qualifications to intersect at a higher valuation. TIME – Time is illusive and there is never a “perfect” time to go out cruising. Let’s face it, life gets in the way and whether you are looking after your parents or your children (or both!) or are waiting for the sale of some property or your business it is pretty easy to rationalize away opportunities that you may never get again. None of us are getting any younger. You have to make the time as part of your plan or you’ll be watching the sand sift through the hour glass instead of squeezing up through your toes on a beach in paradise…we all know time waits for no man or woman. HEALTH – Health is the biggest unknown and probably the largest single deterrent for would be cruisers. You just never know when something might catch up with you. Breaking your leg can really limit your mobility and set you back. Getting sick with a life threatening illness will most likely preclude you from setting sail. If you have good health now and have the TIME and MONEY to pursue your ambitions, what are you waiting for? There is very rarely a “right time” to go cruising. You either figure out a way to squeeze this into your life or you wait too long and miss your window of opportunity, maybe even feeling regret for another thing you did not do in your life. 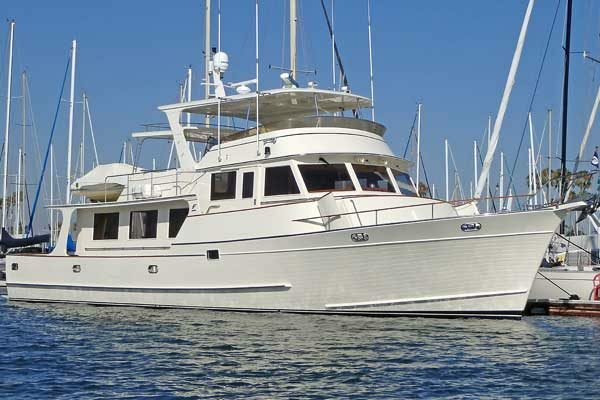 The Trawler Lifestyle is part of a much bigger phenomenon known as the Cruising Community. It doesn’t matter if you are a sailor or a power boater, when you get off the grid and are out exploring there is a natural bond between cruisers to help each other out. Most days in port are loosely organized – maybe some shopping, hiking, sightseeing, but back aboard there are always a few projects and the collective cruising community (often connected by SSB ham radio) can offer advice, help and support if you seek local knowledge or need a hand figuring out an issue on your trawler.